All over the world, all throughout history, dance is and has been one of the most natural ways for the human race to connect with the Divine. Dancing can inspire your mind, heal your body, guide you to spirit, deeply nurture your soul and open your heart. I have been dancing my whole life, I learned from many teachers from various cultures and walks of life. Most of all, I love to dance and I know how to let music and movement guide me into passion, ecstasy and deep connection – within me as well as with others. I have also noticed that I can inspire others into their dance passion – I believe that almost anyone who has seen me on a dance floor can attest to that. 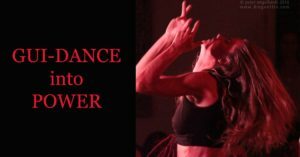 During the last five years I have envisaged and experimented with combining my passion for dance with my work with assisting others in the process of spiritual transformation. Lately I have been fortunate enough to get to manifest and test my dream, with wonderful and truly inspiring results. Now I feel deeply grateful, excited and ready to offer this journey publicly. Come. Dance with me. Let’s shake our bodies, feel deeply, have fun, meditate, integrate, surrender into our essence, into our True Selves, into the Divine – into Power. 70 Euro including organic fruit and tea. The beautiful Temple Space of the Academy of Visionary Arts, Döblergasse 2, 1070 Vienna. Further information, details on how to prepare and what to bring will be sent to you after confirming your participation.